A hidden gem in the breaky club tis the Shaw Cafe, dishing out the aul organic, locally sourced dishes, juices and coffees from the wee hours of 7:30am within the Shaw. We’ve been trialing a lot of dishes recently to see what works for us, and with that – we’ve decided to log all our efforts on the blog so that we’re all perfecto we can have something to look back on. 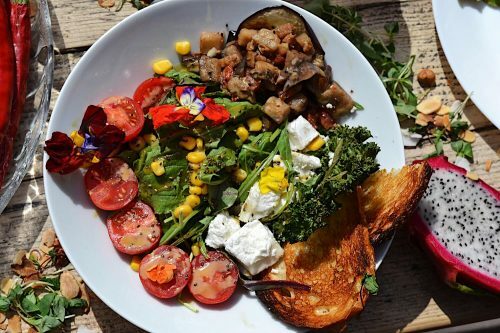 This weeks dish of the week is one of our seasonal salads: Mixed Leaves served with grilled aubergine, corn, cherry vine tomato and crispy kale ‘Wan and give er a taste, fit fam bods coming at ya.